I ordered my first StitchFix back in April (review here) and enjoyed the experience but only kept one item (a dress I've yet to wear because it needs a little altering). I thought it would be fun to order one for our honeymoon and I created a whole Pinterest board with things I wanted in my "fix". Total fail. They sent jeans and blouse-y tops that just don't work in Hawaii. I was pretty miffed so I took some time off. I realized I had some credit to use up and that I was in need a some cute fall clothes. I updated my profile and changed a few things. Then I put very specific notes about cozy sweaters and "basics" in my notes. To review, here's how it works. First, you fill out a style profile to help you stylists pick the perfect pieces for you. Schedule your "fix" for $20 fee. That $20 goes towards any of the 5 items in your fix. Receive your hand-picked goodies, try them on at home with your favorites pumps, belt and accessories. Log into you account online and checkout for the items you're keeping. (Bonus: you get 20% off if you keep all 5!). Send back everything else and schedule another "fix". Willow and Clay Chunky Open Cardigan // $108 // This was the piece I was most excited to try on. I love chunky sweaters because they are so cozy and great for northeastern fall weather. I like the color and it's not something I'd usually pick out on my own. It's not similar to any other items in my wardrobe. At first impulse, I figured this would be the item I kept because I could apply my credit towards it which would make the sweater less expensive. The price is a little steep for my liking. 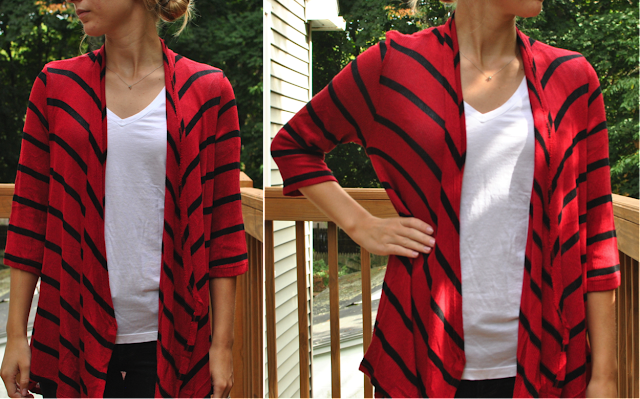 41Hawthorn Addison Striped Knit Cardigan // $48 // At first, I thought this might be cute. It's much thinner than the other sweater and has almost that shiny feel to it. Do you know what I mean? When I put it on, though, it felt like a grandma sweater. It doesn't really doing anything for me and I'm not a fan of the red and black color combo. The sleeves aren't fitted at all which just makes it feel stretched out. Splendid Thessaly Short Sleeve Raglan Top // $84 // First of all, how is this shirt the same price as the one above? There's so much less shirt! 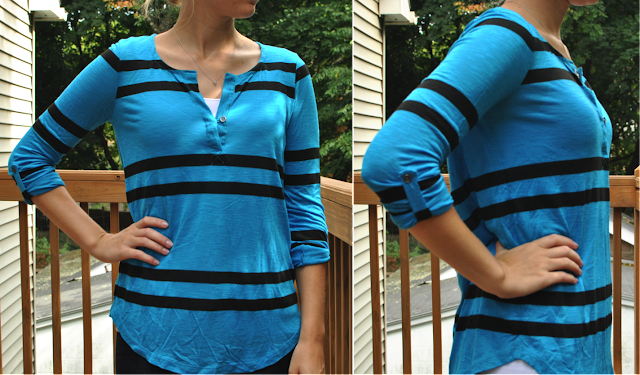 I thought this would be a cute "transitional" top between seasons. However, I was wrong. You can see from the side shot that the top is quite short...if I wasn't wearing a tank underneath it, this would basically be a crop top. For some people, that works. It just doesn't for me. 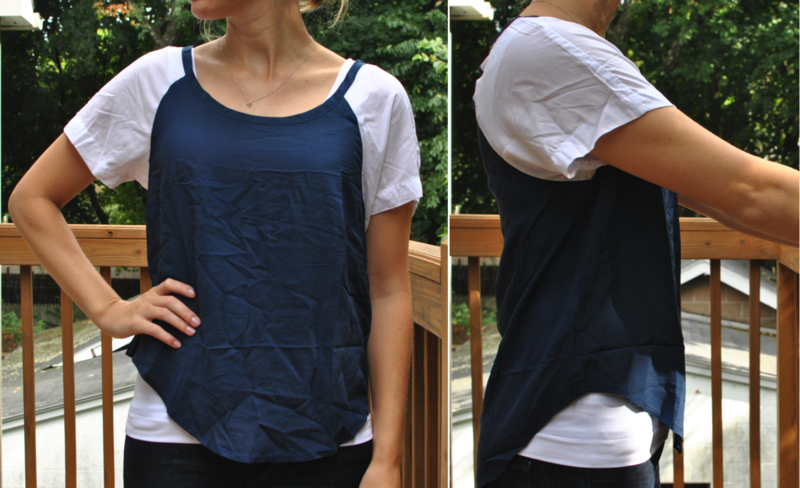 Also, there just isn't enough shape to this top. Lastly, I can see this being an item that I have to iron all the time. See how wrinkly it is already? 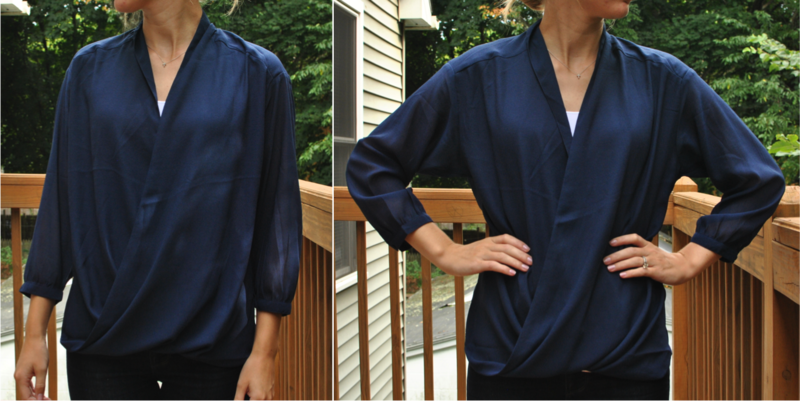 Kut From The Kloth Leighton Twist-Front Sheer Blouse // $50 // Unfortunately, I knew this one was going to be a loser right out of the box. The only thing going for it...is that it's navy. I suppose it could work if you belted it because it looks better with some shape (see picture on the right) but I'm not one to wear a whole bunch of accessories. I can't see it working even if it was tucked in. Overall, this was a better box. I think I was able to convey my style more clearly and the items were all very close. I would possibly order another box in the winter. StitchFix doesn't know I have a blog and all the opinions expressed here are my own. However, I do get a little credit if you use my referral link! Now I need your help...and fast! I have to send the items I'm not keeping back to StitchFix ASAP. Do I keep the blue striped top? Just the sweater? Leave a note in the comments! Definitely keep the sweater! And since you have a little credit splurge and keep the top! great choices this time! I really like the sweater, that is a great choice! I also really like the twist-front blouse--I would maybe tuck it in to a pencil skirt or wear with skinny jeans.